as shown on pictures. Camera & shoulder pod are NOT part of this offer. 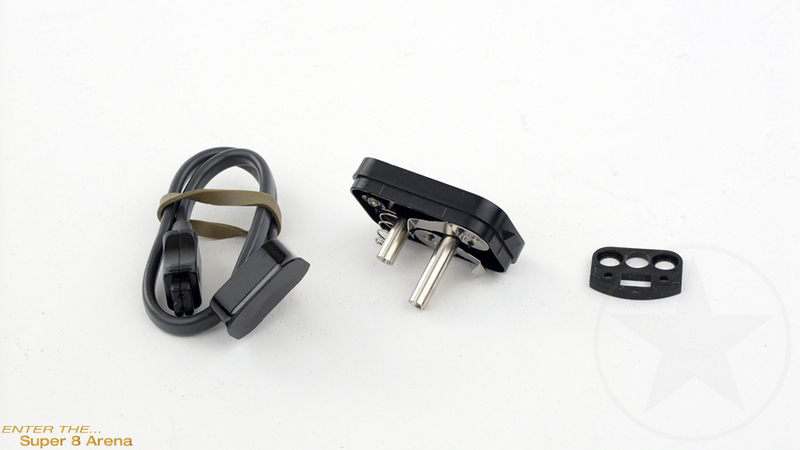 The Braun tripod set consists of: - the connecting lead from the contacts of the battery box in the hand grip to the external power socket on the camera base, - a battery box cover with special contacts, - a special mounting plate. The set provides power supply from the batteries in the safety box when the camera is used with grip folded down, e.g. for mounting the camera on a tripod. The tripod set is suitable for all Nizo cameras with external power connection (2nd and 3rd generation universal type Nizo cameras). The mounting plate holds the hand grip folded ready for use. Under it there is a 1/4'' tripod bush for the screw of the pan and tilt head of your tripod. Slacken the two screws and replace the standard plate fitted with the once supplied in the set which exposes two the thread through the two holes. If the cover of the battery box has not notched contacts replace it with the cover in the set and reinsert the box in the grip. Fit the press stud contacts of the lead over the battery contacts and push the plug on the other end of the lead into the external power socket on the camera base.